FLASH: Torres beats Nava in 10-round battle! In a bout that purportedly lived up to the hype, Ana Maria Torres edged out Jackie Nava with all three judges scoring the bout 96-94. With her win, Torres gains the WBC Diamond Belt. Their battle was fierce, courageous and bloody — with both fighters giving their all as they pushed through their 10 rounds of non-stop action. 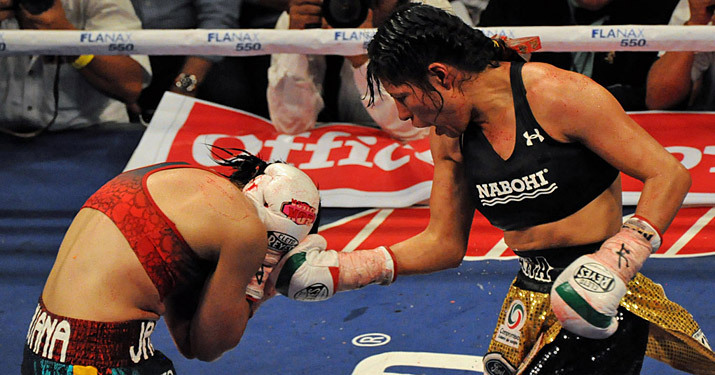 With her win Ana Maria ‘Guerrera’ Torres improves her record (26-3-3, 15 KOs). Any one that thinks womens boxing isn’t as exciting as the mens need to watch theese to warriors. I loved that fight Ima male boxer who supports the women warriors I love them all. Thanks so much for your comment! I LOVE that you love GREAT boxing no matter who is fighting! « Beautiful day, beautiful box, but the work continues.